Happy and cheerful Friday blog friends! It’s rainy here but I don’t have to go out so I put on a fluffy pair of socks and brewed up a huge carafe of French Vanilla Coffee and plan to play catch up on many of the things that escaped my grasp over the last month or so. Yes, catch up – I’m behind on picking winners for Day of Giving Friday and getting my cards sent out, but I plan to be on top of that by tomorrow ! Speaking of Day of Giving Friday todays card is up for grabs to one of my readers – simple leave a comment to get in the running. Every Friday it’s my pleasure to give away a card. The card goes to a randomly picked reader (worldwide) who leaves a comment in our conversation. Want to know more about Day of Giving, here’s a link to my FAQ’s just check out #11. For your comment today: What are your best memories of your Independence Day celebrations (Fourth of July here in the US). P.S. Happy Canada Day to my Canadian friends. 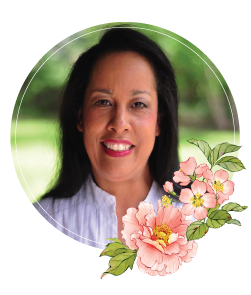 Accessories: Spellbinders 5 x 7 Elegant Labels Four, Spellbinders Majestic Circles, Spellbinders Back to Basics Tags, May Arts Silk Ribbon, Recollection Pearls Wherever you are, have a safe and family filled weekend. I can’t believe we are already to July and more than half through the year. It seems like we just celebrated new years and here we are! Well, I’d much rather be busy – how about you? Gorgeous card as always, Becca! So soft & scrumptious. My best memories are the fireworks! I am a bright color kinda gal, & they sure fit the description. Each Friday just gets prettier and prettier!! Love the bow on this card! Hopiing for to win this one as my birthday is next Friday. One of my cardmaking buddies is also on Friday July 9. One of my favorite 4th of July was after I was elected as City Commissioner I did a pie in the face, which was a hoot!! One I won’t forget. Have a great 4th and GOD BLESS AMERICA! Good morning Becca, wow how to make a girl jealous!!! I can taste the coffee yummy my mouths watering : ) I think it must be your water it makes coffee taste so much better than ours!!! You’ve made me smile on such a difficult day. Bless you!!! You beautiful lady Thankyou!!! Oh my what a gorgeous card!!! I remember the picnics in the park (hot dogs, hamburgers, potato salad, toasted marshmallows, then watching the fire works that the City put on. Beautiful Card Becca. I am in Canada so haven’t had many July 4th celebrations as we are usually in U.S. in the winter time. .
Our most memorable was July 4, 1976. I think it was the USA’s 200th Birthday. Awoke in Wheatridge, Colorado that morning & spent day traveling & scenery was fantastic. Everyplace had flags waving! Went thru Vail & lunch at Glenwood Springs (100 deg) HOT! Too many experiences to mention but I remember that day well. Such a pretty card…all soft and lovely! My best memory of the 4th was back in the early 80s. The Beach Boys had been uninvited to the White House as not formal enough or some such nonsense so instead they came to Denver, and gave an hours long concert that kept my friends and me on our feet, dancing and singing along, embarrassing the children along with us, the whole time. We had such a good time. And then, in honor of the occasion, Denver out on what was billed at the time as, the largest fireworks show ever, west of the Mississippi. It went on what seemed like forever…in reality, about 45 minutes. Good, clean family fun, safe, filled with laughter. People were able to bring in their own food, so picnic style in the stadium. It was simply delightful. I love that bow! Very elegant card! A truly beautiful card, as always. Living in the UK, we don’t celebrate 4 July as you do in the USA but I know I would love the fireworks! Another stunning card Becca. How do you come up with so many beautiful ideas? Wow! I am blown away by this card Becca! It’s stunning! Just love the row of pearls on the tag! Gorgeous!! My favorite memory of the 4th of July is my oldest son’s first Independence Day. It was also his first vacation when he was 3 months old. He’s now 10 and it feels like yesterday! I love the use of some of my old favorite dies!! You are able to think up ways to use these dies and make them new again!! You are just so brilliant at this. What a gorgeous card. An absolut stunning card here again Becca. 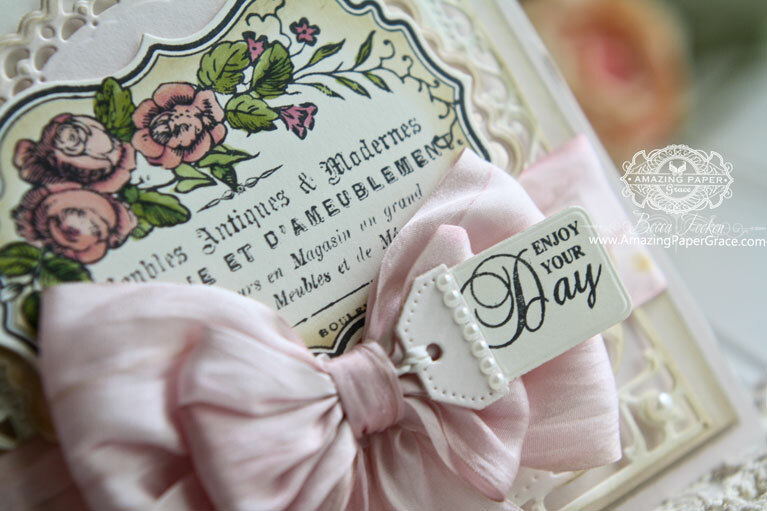 I love the stamp you´ve used and your gorgeous bow with the sweet little sentiment on the tag is just gorgeous too. Everything is beautiful as usual. Hi Becca, We have had intermittent torrential rain here this afternoon, thankfully the rain kept off this morning, it was our town’s Churches Walking Day, every Church and Church School ‘walked’ through the Town Centre. I rained on and off but not hard enough to stop our ‘Walking Day’, and all the children looked gorgeous. This is a beautiful card, with lovely die-cuts and a fabulous bow and tag, gorgeous !! My favorite Independence Day was the year my daughter was on a float in the local parade. She was such a cutie and so proud to be chosen. Many years ago as she is 44 now. This is BEAUTIFUL BECCA! ;) I LOVE the vintage flair! it really allows the black accents to pop! This card is beautiful. I love the way you tie your bowa. Hope you have a great 4th of July. This card is exquisite! A bottle of French parfum, a day at the spa, and I’m good! Oh don’t forget to mail the card (she smiles). Seriously Becca, it’s a beautiful card – made to perfection with the loveliest of feminine touches. Becca Happy 4th of July, My best memories of your 4th July was a year we were there and I have to say I have never seen such a parade in my life. it went on for hours. It was fantastic, and so patriotic. Your card is a beautiful one again Becca. Do you ever have any that don’t turn out?? 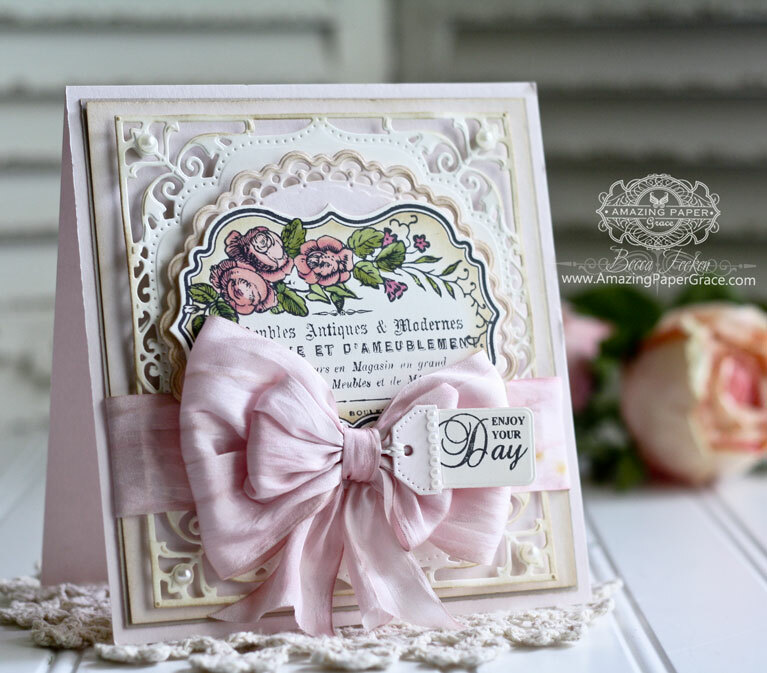 Another lovely pink card…so soft and elegant. I love to watch fireworks live but there have been some spectacular shows on television. One year, I watched a program that named and described different kinds of fireworks. Up to that point, I really didn’t realize there were so many completely different effects – so interesting and amazing! Hope everyone has a happy and safe holiday weekend! Exquisite as usual Becca, thank you for all your inspiration. Wow you have done it again Becca, i am in awe of all your work . Happy July4th . One of my happiest July 4th memories is being at camp with my parents, brother, my maternal grandparents and my great- grandmother. Lovely layering on this beautiful card! Stunning card!! I am always in awe of your die cuts – they are perfect and the dry embossing shows up so well. Do you have a specific/favorite paper that you use to get such perfect cuts and embossing? now. I have been sleeping most of the day as I have come down with a little flu bug. I will try and take in the fireworks tonight but am feeling weak and tired. I Love Love Love the way you make your bows on your cards! All your cards are simply stunning and give me much inspiration! I hope you are all caught up now! Such a lovely feminine card, Becca. Thank you. Your card is just beautiful. I don’t have Independence Day memories as I live in the U.K. but always think of James Cagney singing “Yankee Doodle Dandy”!!! Impressive card Becca, just love all the touches and the light use of color. So attractive & special. The card is scrumptious!!! I love how feminine and delicate it looks with the little details and the beautiful coloring! Lovely card today. That cup of vanilla coffee sounds really yummy. Wouldn’t mind making one for myself, it is so cold hear in Australia at the moment. For Australia Day celebrations my best memory was taking my kids,when they were younger, to the celebrations where they played lots of good old fashioned games like sack races, throwing boots etc. I have visited the states twice & seems that I always leave about a week too early. I plan to come again some time in the next few years, I hope. This time I will definitely have to put it in my itinerary along with Disney Land & any thing crafty lol. Love this card, in fact, I love all your cards! I wish I had your talent. I am wishing and praying for your quick recovery from your foot surgery. I love the butterfly card. It is so pretty. I love all of your cards and don’t really have a favourite. I think they are all of my favorite. I cannot keep up in buying all the dies you use. Keep making beautiful cards for all of us to enjoy and get inspired by so we can make them too. Take care and God bless you.